Collection of the artist. Auckland. A stone I found during a walk along a riverbed inspired the making of this artwork. "Your words will float light like the wood of the whau tree and always remain to be seen but our words will sink to the bottom like a stone. Am I telling lies?" 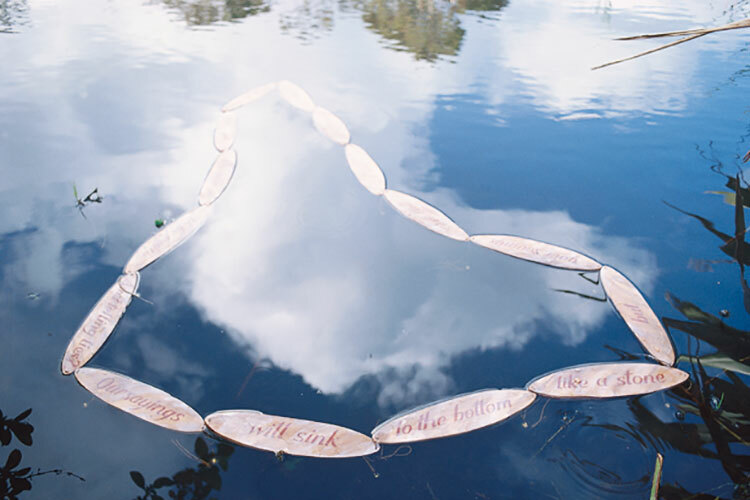 The concept was to re-float words spoken by Mohi Tawhai at the signing of the Treaty of Waitangi. I scribed the stone on slivers of salvaged Kauri to make the 'pages', then cut, drilled and connected the sections with string and lead sinkers, and painted the text using red acrylic. Several years after making this work I was washing the stone to re-exhibit the artwork and noticed faint blue-black pigment at one end of the stone, previously concealed by a layer of river mud. Materials: Salvaged kauri, found stone, lead sinkers, string and acrylic paint.